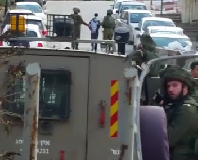 Massive numbers of Israeli soldiers staged an extensive pre-dawn raid on the West Bank village of Kufr Qaddoum last night, storming over a dozen houses. Twenty individuals, aged 16 to 38 were motioned from their beds at gunpoint and arrested. Several of the raided houses were ransacked and left with extensive damage to their interiors. Soldiers have gone as far as pillaging gold jewelry estimated in thousands of shekels from the house belonging to Atta Shtawi, whose son Sabri was detained. Among those arrested are three minors – one 16 year-old and two 17 year-olds – as well as Riad Shtewi, a member of the village’s popular committee. 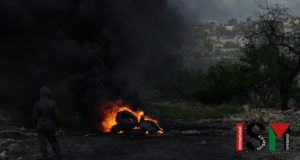 Villagers from Kufr Qaddoum have been holding regular weekly demonstrations for the past 9 months in protest of ongoing land theft by the adjacent Jewish-only settlement of Qadummim and in demand that the main road to the village be reopened. 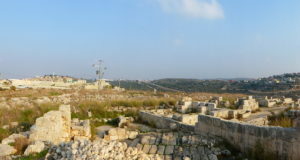 the road has been sealed by the army at the beginning of the second intifada. Protesters in Kufr Qaddoum regularly face ever increasing levels of military violence, including the use of a military assault dogs the soldiers sicced at protesters two weeks ago.